Create a menagerie of quilted critters with exciting foundation-pieced block designs by Margaret Rolfe! Piece a panda, generate a giraffe, render a rhinoceros–or sew up dozens of other birds and animal designs, including a lion, flamingo, toucan, hippo, koala, parrot, and elephant. Stitch even the smallest pieces of your blocks with ease and accuracy when you use Margaret’s fast and fun foundation-piecing technique. Simply trace a design onto the foundation, add oversized pieces of fabric, and sew on the straight lines with your machine! Combine any number of 4″ x 4″ blocks to make small or large theme quilts, or piece your blocks into clothing and other projects. 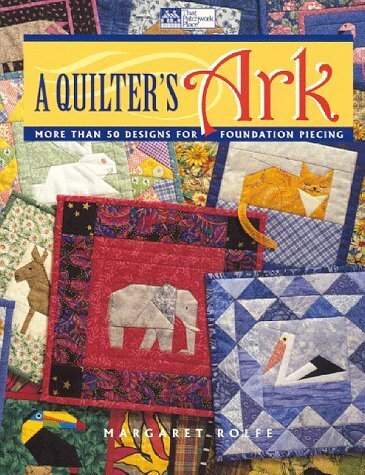 Complete instructions, patterns for four quilts, and a special ark block are included.